N’OS POSITIVOS escolhemos o $$$ acima das habituais listas de autores, publicações e efemérides várias para resumo de 2017 - um tópico transversal à quase totalidade das entradas registadas em banda desenhada do ano em revisão. Todos os anos: a ingenuidade de quem chega, a energia voluntariosa que transborda dos seus projectos. O desalento de quem desiste sem revolta, apenas resignação e silêncio, inocência perdida. Poucos perduram pela banda desenhada. Cada vez mais, e mais novos. Mais velhos, sempre os mesmos, cada vez menos. O ano que acaba teve a sua quota-parte de novidades em autores e publicações. Uns poucos persistiram do ano anterior, e já esquecidos foram aqueles que nos vieram da leva anterior. Como, antes desses, outros vieram, outros se foram. Menos ficaram. Com o tempo todos se vão, alguns serão recuperados, sem consequência, tarde mais. Há os que encontram –e há os que procuram- nos comics um meio de expressão. Também os há que esperam do desenho uma renda sobre o seu tempo neste mundo. Poucos o conseguem combinar porque são, de facto, esforços incompatíveis. Os que resistem às vagas de “originalidade do ano / prémio do ano” e o lento desvanecer que se lhes segue sofrem na determinação à profissionalização alvejada, cientes da árdua tarefa que os espera, instigados pela sua tenacidade em persistir contra as probabilidades. Finalmente, também esses cairão - quando se lhes esgota o tempo. Outros desenham no seu próprio tempo, escusam-se a prazos ou datas. Esses perduram, mas quem o saberá? A resposta, a seguir. Do prefácio do livro, Ben Katchor a fechar tópico e ano. Comics remain healthier as a category of culture than as a category of commerce. Making comics is not a career. 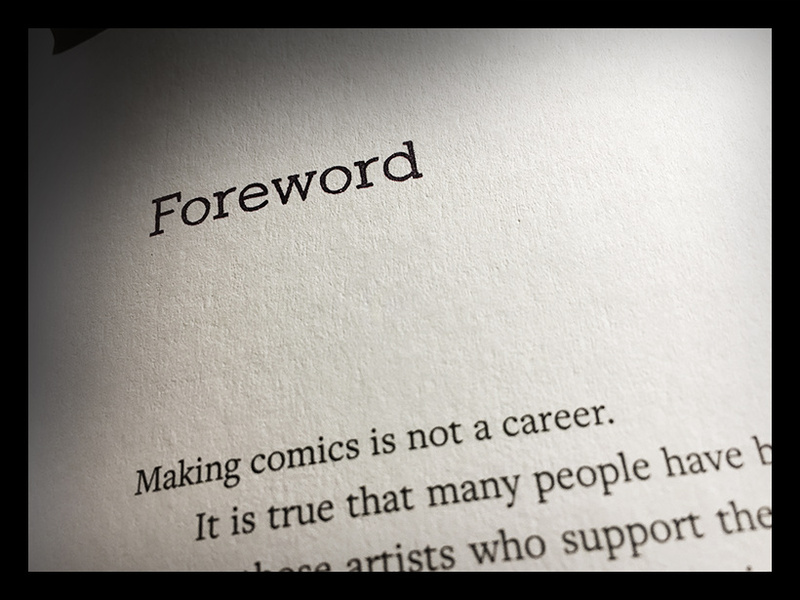 It is true that many people have built careers by making comics, but those artists who support themselves entirely through their comics work are a small group. They are rare exceptions among the countless others who also support themselves with day jobs, freelance work, teaching, original art sales, commissions, illustration, animation, graphic design, and in countless other ways. Artists must often budget their time as they seek to achieve a balance between passion projects and paying work. The field of comics has changed radically in the past twenty years, as robust graphic novel sections have appeared in most bookstores and libraries. I think it could be easy for young artists entering the field now to see so much professionalized output and imagine a broader set of economic possibilities than actually exists. The truth is that most authors of graphic novels—like most authors of prose novels—cannot subsist on modest advances and royalties alone. They are a drop in the bucket relative to the many months—often years—of focused labor required to produce a book-length work in the comics form. It's not at all my goal to paint a dour picture of contemporary comics publishing. Rather, I wish to celebrate the fact that our current vital era of comics still exists against all odds. It is an uphill climb to make this work, with no true guarantees and little expectation of steady reward. 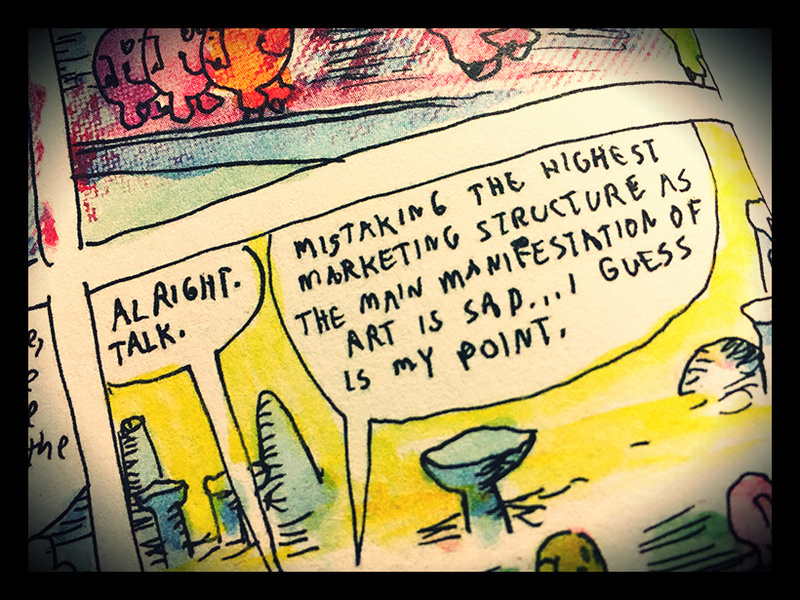 Comics exist because artists are passionate about the art form and its possibilities for personal expression. Precisely because those odds are so daunting, artists entering the field should engage the medium and take risks: expressive risks and artistic risks. In a field with no guarantees, compromising one's work to meet a perceived marketplace is a much riskier gamble than wholehearted, incautious engagement. The odds of financial success are always low, but if an artist pushes his or her work as far as it can go, the chances for personal satisfaction and growth climb exponentially. Personal creative ambition is a safer bet, on its own terms, than a career plan. The artists who have broken through to mainstream attention in the biggest ways have often done so by making the work that they were motivated to make despite the lack of an obvious market or audience. When artists resist limitations, readers gain a fuller and truer picture of everything the art form is capable of. It takes a little vision for artists to see beyond the edges of what comics have been to imagine what they could be. The world did not know that it needed this work until artists made it. The field of comics itself is still—and is always—bigger and more surprising than we can imagine. Transversal ao $$$, salientámos demasiadas vezes o Tempo. Impõe-se a pergunta: quanto tempo tens? Bom 2018, folks. We-be-back. Will ya?